Taking care of your teeth is essential if you want to keep your teeth for a lifetime, and the most important thing for you to understand is that YOU are responsible for their care. Developing a good dental routine takes commitment, but it does not require a lot of time from your busy day. Here are the simple steps you need to know to develop and implement a good dental routine to properly care for your entire mouth. Floss every day. No exceptions. Flossing is actually more important to your oral health than brushing, yet it is the most neglected dental habit. Flossing reaches in between the tight spaces of your teeth where damaging plaque likes to hang out and food particles become trapped. Floss is specifically designed to remove plaque from between the teeth. Brush your teeth at least twice a day. Brushing your teeth is important because it will help to loosen food particles that are stuck on the surfaces of your teeth so that when you rinse your mouth they will be expelled. Brushing with a fluoride toothpaste will protect your teeth from cavities and decay. Replace your toothbrush often. Have you ever wondered why your dentist gives you a new toothbrush at each dental visit? It is because having a clean toothbrush is essential to keeping your mouth clean. Your toothbrush is used to help remove bacteria, food particles, and plaque – some of which will linger on your toothbrush. Your toothbrush should be replaced ever 3-6 months. Rinse your toothbrush and store it properly. It is important that you rinse your toothbrush off after each use under strongly running water to help wash away what was just brushed off your teeth. Storing it in an upright position and allowing it to air dry after each use will also help to kill any bacteria that remain. Visit the dentist regularly. While what you do at home every day is incredibly important, you still need to visit the dentist on a regular basis. Regular cleanings and checkups will help to identify any concerns early before they wreak havoc on your mouth. 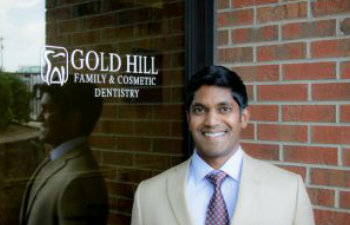 If you are looking for a dental practice to trust here in the Fort Mill area, Gold Hill Dentistry would be honored to serve you and your family. Contact us today to schedule an appointment!